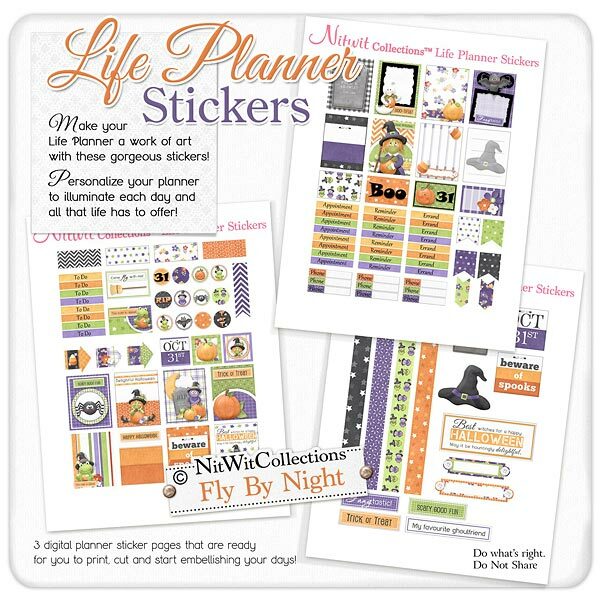 "Fly By Night" Life Planner Stickers let's you celebrate one of the best parts of October....Halloween!! Who doesn't love to either get dressed up in costume or enjoy the works of others. Our friendly witch will show you the way to celebrate this month with a little whimsy, and a little of the devilish side to your personality! 16 - 1.5" x 1.9" full boxes with our friendly Halloween spooks showing off how they celebrate October! 8 - Errand digital stickers that will remind you what to get for the party! 4 - Small flag elements each in the differently coloured star design...you're a star aren't you?! 2 - Arrow elements to point to a special event, day or appointment...now which day is important to you?? 12 - 0.6" intricately designed dots to place anywhere you see fit....how much fun are these?! 1 - Chevron striped strip to place as a bookmark, directly on your page as decor or to highlight a certain weekend perhaps?? 1 - Sentiment tag - "Best Witches for a Happy Halloween..."
1 - Witch's hat...you know where to hang your hat!